Buy Iittala Kastehelmi Tumbler 30 cl 2 pcs Grey by Oiva Toikka, 1964 - The biggest stock in Europe of Design furniture! In 1964, the Finnish designer Oiva Toika created the romantic Kastehelmi decoration of morning dewdrops in concentric rings. Today, the iconic Kastehelmi Dewdrop is available in a variety of stunning colours and products, such as tumblers, jars, votive, etc. 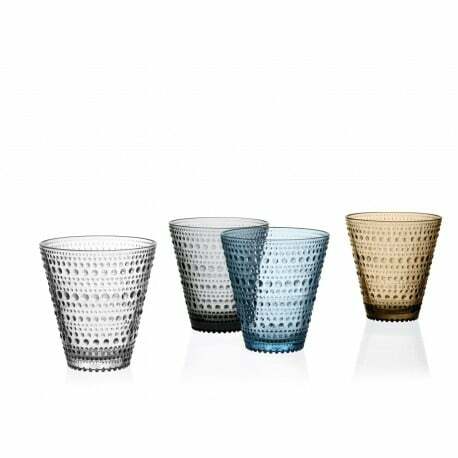 Designcollectors offers you this 30 cl Kastehelmi tumbler in elegant colours inspired by nature: grey, desert and clear. Set of 2.